Churrasco is a Portuguese/Spanish term referring generally to grilled beef, a popular ingredient in the cuisine of Argentina, Brazil, and other Latin American Countries (according to Wikipedia). If you have ever been to a Brazilian Steakhouse, you certainly are familiar with this concept. It is a meat-lover’s dream, with “gauchos” swarming about you with skewers of different cuts of meat fresh off the grill, offering as much as you can eat. One of my favorite steakhouses, Fogo de Chão, also boasts the most beautiful salad bar, filled with salads, fresh vegetables, cheeses, and cured meats. It is a wonderful dining experience! Although we don’t have gauchos here at the house, we did want to create a dinner with Latin American flavors. I selected grass-fed inside skirt steak for the grill, which has a little more fat than regular skirt steak, and has a loose texture that is perfect for marinating. Churrasco is often served with or marinated in chimichurri, a green sauce traditionally made with parsley, garlic, olive oil, and vinegar. 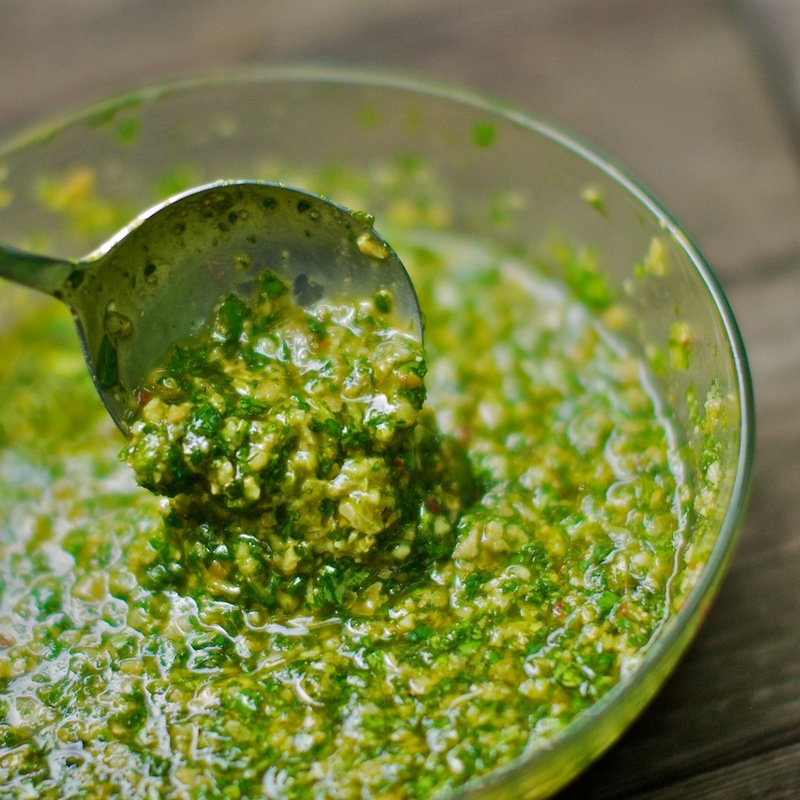 Instead of using parsley, I took a few pointers from Three Guys from Miami and used cilantro to make more of a Cuban version of chimichurri – then I added pepitos (roasted pumpkin seeds) which made the sauce more the consistency of pesto. 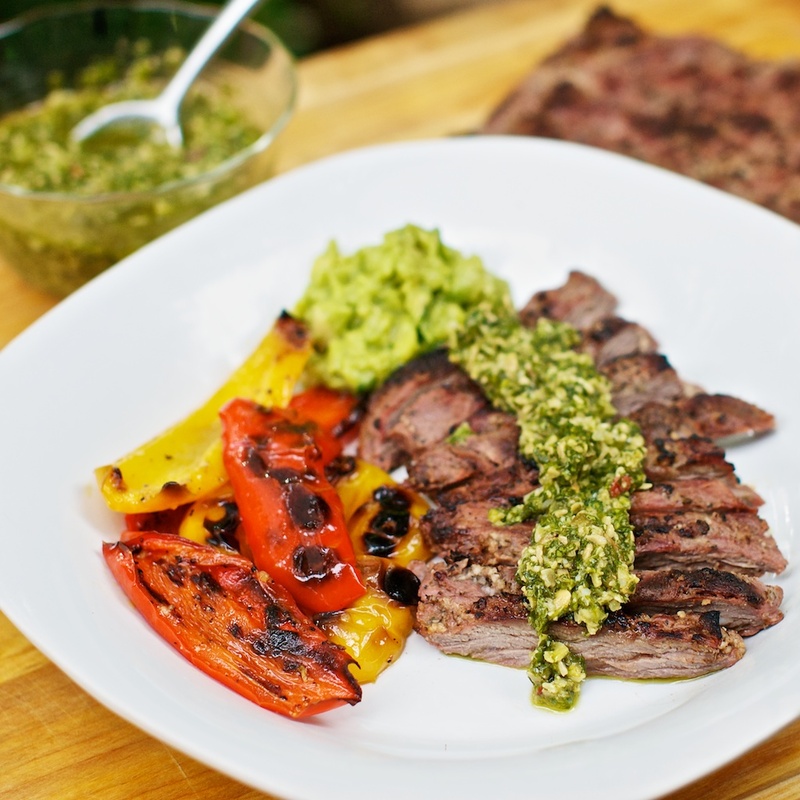 As you can see from the photo, the churrasco was served with grilled vegetables and guacamole, and was topped with the intensely flavored, garlicky cilantro pesto. It was delicious! What you can’t see is in the middle of grilling the peppers and eggplant, yet another huge thunderstorm blew in unexpectedly leaving us both under the “grilling umbrella”, which provided little shelter from blowing rain. We were soaked by the time the meat came off the grill, and didn’t get a single photo of our food that night. These are the leftovers on the next day! (The eggplant, all gone…) Ah, the joys of summertime living in the southeast. Cut the skirt steaks in half, so they will fit better on your grill. Place in a glass baking dish or resealable plastic bag. Process the remaining ingredients in a food processor or blender until smooth. Pour over steaks and allow in marinate in refrigerator for at least 4 hours, but preferably overnight. When ready to grill, remove from refrigerator and allow to come to room temperature before cooking. Put all ingredients except olive oil in a food processor; pulse on and off until mixture has a consistent, but still chunky, texture. Place mixture into a small glass bowl and stir in olive oil. (If you process it with the oil, it will become paste-like, you don’t want that.) You will need to adjust the seasonings by taste – so add salt, pepper, vinegar, lime juice, and/or more olive oil as needed. It should have an intense garlic and cilantro flavor. A little bit will go a long way! Check the local weather report for sneaky thunderstorm activity. Set up the grill for direct cooking at around 500F. Grill the steaks for around 4 minutes on each side until nicely seared, but still pink inside (medium rare to medium). Place steaks on cutting board and allow to rest for 5-10 minutes, then slice into thin strips across the grain. Serve with chimichurri sauce! Gettin’ mighty tired of this cooking in the rain business! But when the results are as tasty as this, it’s worth it! 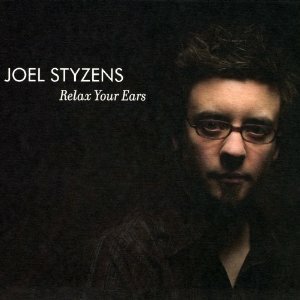 Two new arrivals to share, the first being some perfect music to accompany a rainstorm, Relax Your Ears from Joel Styzens. Styzens had been a drummer in Chicago until he came down with tinnitus, potentially ending his musical career. But lucky for Joel- and us- he found an outlet in acoustic guitar. This album, recorded with cellist Katinka Kleijn, is a gorgeous piece of work that truly does “relax your ears”, but not in that mushy, aimless way of “new age” stuff, but with engaging, dynamic pieces. And I’m sucker for the combination of cello and guitar anyway. Give this a try! 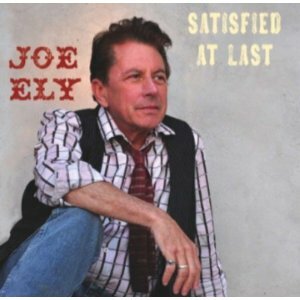 We saw the Flatlanders a few months back, and I was glad to hear Joe Ely tell of an upcoming solo album, and here it is- Satisfied at Last . And if you’re a long-time Ely fan as I am, you’ll be satisfied indeed. His trademark storytelling style, along with a few Butch Hancock tunes makes this a welcome release from the Lubbock troubadour. His version of Billy Joe Shaver’s “Live Forever” is just wonderful. Hmm, I’m just gonna tell you what I said when I saw the picture. Oh WOW! Thanks, y’all! We thought “WOW” and “amazing” too, when we tasted it! What a perfect dinner for a summer night. Gorgeous! I’m a little surprised you give props to Fogo De Chao, since they charge way too much for the small amount of meat the “average, normal” human would ever think of eating at one meal. Who in their right mind could eat half a dozen different cuts of meat at one meal? Uh, me? It’s a wonderful experience, and since we eat a lot more meat than the average human, its a great deal for us! perfetc! such a fresh recipe! At $60 bucks a shot, how could it possibly be a great deal? Or is the cost even higher now? FB, you’re not grasping the notion that we don’t go out to eat for a great deal, we go out for the dining experience – which includes having really delicious food brought to us for our enjoyment. I don’t have any problem with it costing $60 a person, or $100, or even more than that if the food is worthy, the service is impeccable, and the company is delightful! We rarely go out for a big meal…it’s a treat! Same goes for dining at Bacchanalia, The French Laundry, Gary Danko’s Dining Room, etc. – it’s the experience, not the raw value of the food. If we want a deal, we stay at home! You’re right, I forgot that my means are substantially more limited than your combined means. Sorry about that. I also eat less meat than you do, so it doesn’t seem as appealing to me as it does for you. Apologies. Thank you. I certainly have no intention of causing trouble, or putting the cat among the pigeons, on your blog. It is one of only 5 non-political blogs I make time to look at. Sorry that you did not like the photo of the steak. If you had read the post, you would have noticed that the photo was of leftover steak. It wasn’t dry, but it was cold out of the refrigerator for the “photo shoot”. Also, unfortunately, it looks overcooked, but it was pink the night before. I don’t recommend photographing food the next day, but you can’t prevent thunderstorms! This entry was posted on June 26, 2011 by She cooks...He cleans in Beef, Entrees, Sauces, Marinades, and Rubs and tagged Argentinian, beef, BGE, big green egg, chimichurri, churrasco, cilantro, cook-out, Cuban, garlic, grass-fed, grill, lime, low-carb, marinade, paleo, pesto, primal, recipe, skirt, steak.